* Sélection Officielle "Un certain regard"
* Prix "Un certain regard"
African cinema's founding father, 81-year-old Ousmane Sembene, continues to be its most fiery, provocative spirit. Extending the strong feminist consciousness that marked his previous triumph Faat Kiné (as well as such earlier classics as Black Girl and Ceddo), Moolaadé is a rousing polemic directed against the stillcommon African practice of female circumcision. The action is set in a small African village, where four young girls facing ritual "purification" flee to the household of Collé Ardo Gallo Sy, a strong-willed woman who has managed to shield her own teenage daughter from mutilation. Collé invokes the time-honored custom of moolaadé (sanctuary) to protect the fugitives, and tension mounts as the ensuing stand-off pits Collé against village traditionalists (both male and female) and endangers the prospective marriage of her daughter to the heir-apparent to the tribal throne. Though the subject matter might seem weighty, this buoyant film is anything but-Sembene places the action amid a colorful, vibrant tapestry of village life and expands the narrative well beyond the bounds of straightforward, socially conscious realism employing an imaginative array of emblematic metaphors, mythic overtones, and musical numbers. 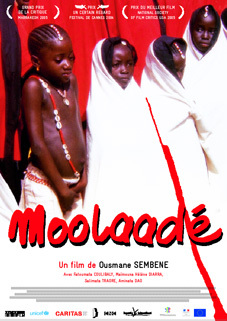 Winner of the Grand Prize in the Un Certain Regard section of the 2004 Cannes Film Festival, Moolaadé was selected by many prominent critics as the best film of the entire festival. Senegal/France/Burkina Faso/Cameroon/Morocco/Tunisia 2004, 35mm, color, 120 min. La leçon de cinéma de Sembène Ousmane au Festival International des Films de Quartier (Dakar), 15-20 décembre 2004. Cinq films seront présentés dont Moolaade de Sembene Ousmane en avant première. As part of Africa 05, Africa at the Pictures presents an exciting and groundbreaking festival of contemporary African film at a number of major venues across London (June - September 2005). 5e édition - Cet été, Venez vous rafraîchir à l'ombre des baobabs...!! 6e édition. Marché nocturne, concerts, projections cinéma, tournoi de football. Cette année encore, tous les bénéfices seront reversés à PPVS pour permettre la construction de cases de santé dans la région de Fatick au Sénégal. To commemorate the legacy of the great Senegalese director Ousmane Sembene, who passed away in June this year, Filmhouse is screening his last film, Moolaadé, on Monday 13 August.